No-rinse sanitizer that contains no chlorine. Requires one minute of contact time to sanitize. Sanitizer that contains no chlorine. It is an iodine based sanitizer requiring one minute of contact time to sanitize. 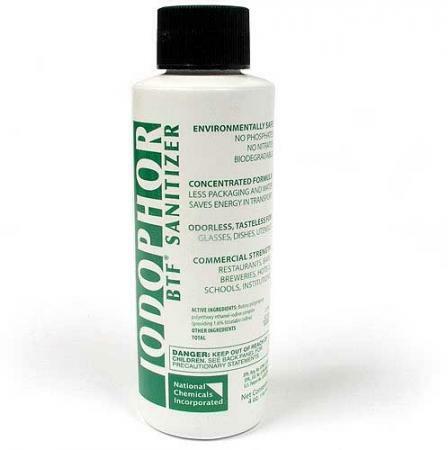 Iodophor is a no-rinse sanitizer if used in the correct proportions. If the working solution is too strong, iodine odors will be left behind unless rinsed away. Usage: Add iodophor to cool or lukewarm water. Never use hot water to mix iodophor. To make the 12.5 ppm no-rinse solution use 1/4 oz (7 mL) iodophor to 2.5 gallons (9.5 L) of water. General Directions for Use: Scrape and prewash glasses, dishes, or brew materials whenever possible. Wash with a good detergent or cleaner. Rinse thoroughly with plain water. Sanitize in an iodophor solution made to 12.5 ppm concentration for at least 1 minute. Place sanitized items on a rack or drain board to air dry. Never towel dry.